My kids brought colds home from school, and despite my frequent hand washing, a sore throat is setting in. To cut this cold off before it gets bad, I'm relying in a healthy mix of nutrition superheroes. This fight starts with breakfast. 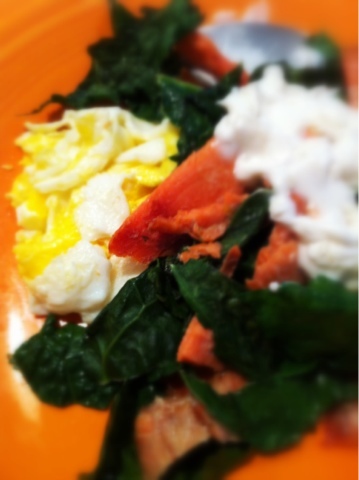 I cooked wild Alaskan salmon with kale and one egg. This combination is wonderfully rich in omega 3, antioxidants, and nutrients. To fight off any incoming bugs, I pressed raw garlic into a small spoon of aioli and mixed it into the greens at the table. My accompaniment for this healthy kickstart is a warm glass of green tea (more antioxidants). When I'm fighting off a new cold, this type of eating serves my body well. The garlic, alone, seems to work wonders in the first stage of onset. I add zinc, d3, and a high quality multi vitamin to help me out, further. Later today I will continue eating antioxidant and nutrient rich whole foods, and avoiding sugar. This protein rich breakfast is also great for introducing veggies into your morning meal. Be healthy! We are doing the same thing here! Fighting a cold. For the sore throats around here we are doing some blueberry smoothies with loads of kale in the afternoon. It feels good on the throat. I agree, the smoothies feel great on the throat. That is our favorite after school snack. Gotta love that vita mix!